Beginning next Friday, a new exhibit called Mapping the Mountains: The Photographs of George Masa opens at the Asheville Art Museum. The exhibit examines the photography of George Masa, a man also known as "the Ansel Adams of the East". 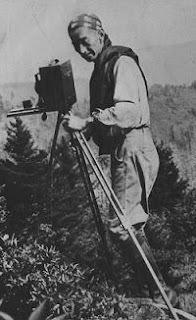 Many of his photographs were used to promote the idea of preserving the Smoky Mountains as a national park. Masa, born in 1881, was a Japanese businessman and professional photographer who arrived in the United States in 1901. In 1915 he settled in Asheville, North Carolina where he would spend the rest of his life. After initially working for the Grove Park Inn as a bellhop and valet, and at Biltmore Industries as a woodcarver, Masa would eventually start his photographic business by developing film for hotel guests. His customers included some of the town's most affluent citizens such as the Vanderbilt, Grove and Seely families. As his work grew, he began taking his own photographs specializing in landscapes. Many of his photographs appeared in newspapers, magazines, postcards and promotional brochures, and did much to popularize the region. Masa came to love the mountains of Western North Carolina and worked tirelessly for their preservation - at his own expense. Using his photographic equipment and an odometer he crafted from an old bicycle wheel, Masa meticulously catalogued a significant number of peaks, the distances between them, and the names given to them by the local settlers and the Cherokee. He was a close friend of Horace Kephart and the two of them worked together to promote the establishment of a national park in the Southern Appalachian Mountains. Masa also helped to establish a route for the Appalachian Trail through the Southern mountains. He helped found the Carolina Mountain Club and co-authored the first guide books to the Smokies and southern section of the Appalachian Trail. Masa died in 1933 from influenza. Although he was an extraordinary photographer, Masa was not financially adept and wound up dying penniless. His sincere desire was to be buried next to Horace Kephart near Bryson City, NC, who tragically died in a car accident in 1931. Instead, Masa was buried in Asheville. One year after his death, Great Smoky Mountains was officially established as a national park. 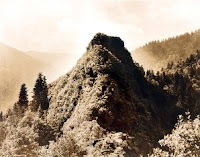 In 1961, Masa Knob, a 5685-foot peak in the Great Smoky Mountains, was named in his honor. It stands next to Mt. Kephart. Mapping the Mountains: The Photographs of George Masa, will be on exhibit at the Asheville Art Museum from February 6 - June 7. The Museum is located at 2 South Pack Square in Asheville. Regular museum hours are: Tuesday - Saturday 10 a.m. - 5 p.m., Fridays 10 a.m. - 8 p.m., Sunday 1 - 5 p.m. Admission is free. For more information please visit www.ashevilleart.org or call 828-253-3227. The Carolina Mountain Club is currently accepting great photos for their new photo contest. The theme for this year's contest is "Defining the Carolina Mountain Club Experience". The club's theme is broad enough to permit almost any club related image and could include vistas, forests, streams, waterfalls, close-ups, wildlife, flowers, the seasons, weather… even club meetings or events. The contest ends on March 31, 2009 and members will select the top three winners at the Spring Social, April 25, 2009 after seeing a slide show of the best entries. You must be a member to enter the contest. 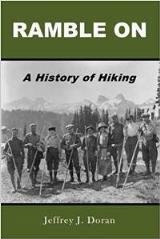 Of course it only cost $20 for an individual member to join the oldest Hiking and Trail Maintaining Club in Western North Carolina. For more information and photo contest rules, please click here. A commission examining our national parks will commence a three-day meeting today at the Mammoth Hot Springs Hotel in Yellowstone National Park. The meeting is being conducted by the National Parks Second Century Commission, a group which has been formed to examine the role of national parks and will help to develop a vision for their future. The Yellowstone meeting is the third of five meetings the Commission is conducting over the course of a year-long process. The Second Century Commission consists of nearly 30 national leaders and experts, including scientists, historians, conservationists, academics, business leaders, policy experts and retired National Park Service executives, and is being led by former Sens. J. Bennett Johnston Jr. of Louisiana and Howard H. Baker Jr. of Tennessee. The group will also hear from a range of experts, park managers, and the general public. As an example of some of the issues being discussed, Sally Jewell, one of the commissioners and a member of the National Parks Conservation Association board of directors, warned of a "growing disconnect between children and nature." Connecting children to the parks is the first step in creating the environmental stewards of the future, said Woody Smeck, superintendent of the Santa Monica Mountains Recreation Area. There are local issues that the national parks will need to consider as well. Gretchen Long, trustee and current board member of the National Parks Conservation Association, challenged the commission to consider how the use of parks is influenced by urban sprawl, legislative mandates and other forces. One Simi Valley resident attended the first meeting in California because he's worried about the government seizing his private property for parkland. He believes officials will "use all kinds of measures to prevent people in using their land in any way, shape or form." The last meeting will take place in Great Smoky Mountains National Park from June 2 through June 4. Commissioners will then put together a report, with recommendations, that will be delivered to the Department of the Interior by late 2009. Citizens have an opportunity to make their voices heard during this process. You can offer input through the Commission's website, or, you can speak to specific issues through one of the seven working committees. Please visit the Second Century website for more information. Stephen Regenold, a nationally-syndicated newspaper columnist, and author of The Gear Junkie blog, is sponsoring the Top 10 Gear Giveaway over at his website. He'll be giving away a total of 34 gear packages to winners of the contest. The prize packages are based off The Gear Junkie's Top 10 Gear Picks awards and represent the best of the best products he reviewed in 2008. Some of the gear packages you could win include a mountain bike suit that absorbs impact if a rider gets in a crash, REI Shuksan eVent jackets, Salomon Speedcross running shoes, camping gear, cycling gear and many other items. The promotion ends on Feb 3., so you'll need to sign-up soon. For more information, please click here. As many of you are aware, as a result of salmonella contamination, there has been a major recall of several peanut butter products manufactured by the Georgia-based Peanut Corp. Yesterday, Peanut Corp. issued a massive recall list, and included on that list are trail mix and energy/trail bars that the FDA found could contain tainted peanut butter paste. Included on the list are 14 flavors of Clif Bars (including their MOJO and Luna bar brands), peanut butter cookie-flavored LÄRABARs made by General Mills, and Nature's Path Organics' peanut butter-flavored Optimum Energy Bars. Peanut Corp. usually sells their nutty product in large bulk to companies like Kellogg's, Clif Bar, and Nature's Path Organics. The company's brand has since been linked to 6 deaths and the sicknesses of at least 474 people. If you've purchased any of these products, be sure to check the "best by" date first; only bars bearing specific "best by" dates are at risk for contamination. For the FDA's complete list of all products recalled, including dates, click here. As a result of snow and ice yesterday and overnight, nearly every road in the Smoky Mountains is temporarily closed today. Please check back with the national park website, or call (865) 436-1200 to find out when these roads are open again. If you recall from a couple of previous posts, a group of adventurers have been retracing Ernest Shackleton’s first expedition to the Antarctic in honor of the expedition’s 100th anniversary. Today we learned that the Matrix Shackleton Centenary Expedition reached the South Pole over the weekend, after spending 66 days out on the ice. Speaking of the Antarctic, have you ever wondered what "Condition 1" weather is like? Last week the Southern Environmental Law Center released their list of the top 10 most endangered areas in the south as a result of immediate and potentially irreparable threats in 2009. On that list, and coming in at number 10, was the Cherokee National Forest in Northeast Tennessee. The Southern Environmental Law Center (SELC) placed Cherokee National Forest on the list due to "The U.S. Forest Service is moving forward with its plans to log several areas of this remarkable landscape, endangering trout, unbroken wildlife habitat and rare species." The SELC states that logging thousands of acres would significantly impact the forest, wildlife, waters, and recreation. Additionally, logging operations would be visible from the Appalachian Trail. The SELC is the largest environmental advocacy organization dedicated solely to protecting the Southeast. They perform law and policy work throughout the six states of Virginia, Tennessee, North Carolina, South Carolina, Georgia, and Alabama. The Cherokee National Forest is located in Eastern Tennessee and stretches from Chattanooga to Bristol along the North Carolina border. It also borders Great Smoky Mountains National Park in the southwest and northeatern areas of the park as well. The 640,000-acre forest is the largest tract of public land in Tennessee. Millions of people every year visit the national forest to hike, camp, fish, canoe, kayak or view wildlife. Great Smoky Mountain National Park issued a winter weather advisory on their website this afternoon. The region is expecting dangerously cold temperatures and wind chills through this weekend. Gatlinburg is expecting lows of 5 degrees Thursday night and 0 degrees Friday night. In the mountains there's a chance of light snow, and wind chills of minus 10 to minus 20 degrees. This definitely wouldn't be a good weekend to be out in a tent or backcountry shelter. For more in-depth forecasts, visit the weather page for additional information. I found this video on the Adventure Blog the other day. People commenting on the video seemed to think that it was fake. I'm not so sure. What do you guys think? Slow it down, frame by frame. I didn't see where or how they replaced the human with a dummy. Real or not? What's your opinion? Outside Magazine has recently posted a list on their website of what they consider to be the top 100 Adventure websites. I'm sure a lot of you are already familiar with several of the sites on the list, but I'm sure you'll be able to find a few to add to your favorites. The magazine took the time to group the sites into several categories, including travel, sports, adventure and environment, health, gear, weather, phones and then maps, widgets and friends. When Outside put the list together, they worked off the mantra of "Get the info you need. Then get out the door." Over the next several weeks, Townsend, Tennessee will be hosting several events in conjunction with the year-long celebration of the 75th anniversary of Great Smoky Mountains National Park. Townsend, also known as the “Peaceful Side of the Smokies”, is located roughly 15 miles west of Gatlinburg. 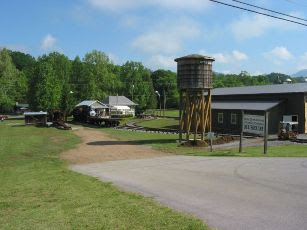 Representatives from the Little River Railroad Museum will lead a short walking tour of Townsend or Tremont (visitors choice) showing railroad track locations and the structures that were part of the lumbering and logging operations that took place from 1901 to 1939 in and along side of what is now the National Park. Photos and other materials will be shown to help describe how people lived and worked during this period. Attendees will meet at the museum in Townsend at 10 AM. For more information email president@littleriverrailroad.org or call 865-448-2211. The Winter Heritage Festival is a celebration of the cultural heritage the region with classes, tours, exhibits, music, hikes, and demonstrations. Examples of programs to be presented are: stories of mountain life, logging and railroad days, illustrated talks and displays about people and the land, history of the Eastern band of the Cherokee Indians, mountain music and dance, creation of the Park, Civil War in the Smoky Mountains, and more. Please visit www.smokymountainfestivals.org/#/winter or call 865-448-0044 for more information. Local artisans showcase their talents in paintings, woodcarving, pottery and quilts while musicians share their gift of bluegrass, fiddle tunes and making instruments. Dancers teach clogging lessons to children of all ages, while historians and nature photographers share their knowledge of the Smokies and storytellers spin their tales. Little River Railroad volunteers share the history of the railroad and its impact on the Townsend area. Call 865-448-2211 for more information. Gather your friends and family and create a team for the Legacy of Tremont Scavenger Hunt! This special edition hunt will honor both GSMNP's 75th anniversary and Tremont's 40th anniversary. The scavenger hunt will review the cultural and natural history of the park while exploring issues and resources that affect the park today. The hunt will range over most of the Park, using roads and trails to access particular areas, and some questions may require some research in order to answer. There is a registration fee of $100 per team. You can have as many people on your team, provided they all fit into one vehicle. A registration form must be completed and submitted to Tremont no later than 4 p.m. on Monday, March 9, 2009. The event will take place over a 24-hour period. Teams will receive their scavenger hunt list via e-mail at 5 p.m. on Friday, March 13th and must return their completed list to Tremont by 5 p.m. on Saturday, March 14th when tallying begins. A light dinner for participants and sponsors will be available and winners will be announced and prizes awarded at 6 p.m.
For more information, email at mail@gsmit.org or call 865/448-6709. We’re almost a full week into the New Year, which means many people are in the process of implementing new programs or are already working on their New Year's resolutions. In a recent post I highlighted a few of the top home fitness trends for 2009. Now, Amazon.com is featuring a "Top 10 New Year’s Resolutions" event, filled with hundreds of products and great savings to help keep your resolutions this year. Amazon is offering numerous bargains and specials on products to help you keep your resolutions this year; from losing weight and getting in shape, to fixing your finances, pursuing a new career and even quitting smoking. To see what all Amazon has to offer, please click here. On Friday, January 16, the Diana Wortham Theater in Asheville will host the North Carolina premiere of the PBS series Appalachia: A History of Mountains and People, a visual narrative on the environmental history of Appalachia. The evening kicks off at 6:00 PM with a reception for the filmmakers and special guests, followed by a 7:00 PM panel discussion and screening of the film. Admission to the reception and film is $30, while tickets for just the film screening are $15. The Southern Appalachian Forest Coalition and Southwings are pleased to sponsor this presentation of one episode of the four part series, Mountain Revolutions, a compelling account of mountain people, culture and geography. All proceeds will benefit their conservation work in the Southern Appalachian Mountains. Also, per Smoky Scout’s explicit request (lol), I did find out that the film will premiere on PBS in April. It looks like the first of the four-part series will run on April 9. In conjunction with the year-long celebration of the 75th anniversary of Great Smoky Mountains National Park, Pigeon Forge and Gatlinburg will be holding several musical performances highlighting the rich musical heritage of the region. AppalachiaFest will be held on January 13 at the Country Tonite Theater in Pigeon Forge. The 3rd annual AppalachiaFest will feature Tim O'Brien, Dirk Powell and Riley Baugus and Boogertown Gap as they play old time, traditional mountain songs in the old time mountain style. A portion of the proceeds (25%) will be donated to Friends of the Smokies and WDVX Radio in Knoxville. The concert is actually a part of Pigeon Forge's popular Wilderness Wildlife Week. The Country Tonite Theater is on Showplace Blvd in Pigeon Forge. The concert begins at 7:30 but there’s a lobby pre-show at 7 pm. Please call 865-429-7350 for more information. The Cabin Fever Singer / Songwriter Series will be held at the Hard Rock Cafe in Gatlinburg on January 15 and 29, and on February 12 and 26. The original homesteaders in the Smoky Mountains region played Celtic music, which evolved into Bluegrass music, which has since evolved into Acoustic Americana. The Hard Rock Cafe in Gatlinburg offers an opportunity to shake off Cabin Fever as area Singer / Songwriters come out of the woodshed to share their original music with an audience that appreciates the Appalachian heritage of picking and grinning. If you wish to participate by playing your own music, it will cost $15. However, if you just want to listen, it’s completely free. The Hard Rock Cafe is located at 515 Parkway in Gatlinburg. Please call 865-430-7625 for more information. Finally, the New Year has arrived! And with it, for most of us at least, a little more weight to carry around. Fortunately, all the partying, big meals, cookies and candies are behind us for awhile. As with every other new year, most of us have probably made a personal vow to lose that extra weight we’ve gained over the last several weeks. So what’s your plan to get back on track? Will you take up running, cycling, or maybe a brand new sport this year? Maybe you’re looking to get in shape for a big race or a backpacking trip later on this year? Both the American Council on Exercise and the American College of Sports Medicine are predicting that fitness programs that take up less time and are easy on the pocketbook will be popular this year. Because of the tough economic times, more people will be working out in their homes. Some of the home fitness programs expected to be popular during this year include yoga, pilates, stability balls and kettlebells. The following are some of the top fitness trends for getting back in shape in 2009. Kettlebell training involves the use iron weights to develop whole body fitness and core strength. Once the prized, and guarded training secret of elite Russian athletes, old-school strongmen and the military, the kettlebell has gained popularity in the West in recent years. Looking somewhat like a cannonball with a handle, kettlebell workouts are intended to increase strength, endurance, agility and balance, challenging both the muscular and cardiovascular system with dynamic, total-body movements. Thanks to former Soviet Special Forces physical training instructor and strength author, Pavel Tsatsouline, for introducing the sport to America. Credit his publication of The Russian Kettlebell Challenge in 2001 and his manufacture of the first traditional Russian kettlebell for starting the Russian kettlebell revolution in the West. For more information on Pavel's training program and DVD, please click here. To purchase kettlebells, please click here. Wii Fit is an immensely popular video workout. It offers an extensive array of fun, dynamic and challenging activities, including aerobics, yoga, muscle stretches and balance oriented games. The focus of these activities is towards providing a "core" workout, a popular exercise method that emphasizes slower, controlled motions. The Wii Fit program allows you to keep tabs on your daily progress with easy-to-understand graphs and charts. A total of 647 Amazon customers have rated this 4.5 stars out of 5. Please click here for more information on Wii Fit. The P90X system is a set of DVD workouts which involve body-weight moves (like push-ups, pull-ups, plyometric moves, etc) as well as cardio and weight training cycles. In addition to enough exercise space, the equipment you’ll need for this system are free-weights of varying sizes, a chin-up bar/station and a yoga mat and blocks. Some people also use bands, as well as push-up bars. The secret behind the P90X system is an advanced training technique called "Muscle Confusion," which accelerates the results process by constantly introducing new moves and routines so your body never plateaus, and you never get bored. The set of 13 DVDs in this set include workouts for Chest & Back, Plyometrics, Shoulders & Arms, Yoga X, Legs & Back, Kenpo X, Stretch X, Core Synergistics, Chest, Shoulders & Triceps, Back & Biceps, Cardio X, Ab Ripper X, and finally, How to Bring It. For more information on the P90X system, please click here. For more information, please click here. Stability balls are often referred to by a number of different names, including exercise ball, balance ball, fitness ball, pilates ball, sports ball, Swiss ball, or yoga ball. No matter what you call them, the primary benefit of exercising with a ball as opposed to exercising directly on a hard flat surface, is that the body responds to the instability of the ball to remain balanced, thus engaging many more muscles while doing so. Those muscles become stronger over time in order to keep balance. Core body muscles (abdominal and back muscles) are the focus of exercise ball fitness programs. Stability Balls are quickly becoming a standard item for any home gym. To purchase a stability ball, please click here. If you’re looking for effective Stability Ball home workouts, instructor Kimberly Spreen has developed 5 distinctive workouts, each one specially designed to tighten and tone your body. Voted Top Workout of 2006 by Natural Health Magazine, this DVD allows you to split the 10 minute sections into 5 separate workouts, or mix and match to hit your own unique problem areas - or do all of them together. For more information on the DVD, please click here. A suspension trainer is essentially a pair of straps with handles that you attach to any overhead point, such as a beam, tree limb or door. Part of your body is off the ground on every exercise. For example, you can do push-ups or squats holding the handles or put your feet in the handles and do crunches. Jeff Halevy, personal trainer and fitness coach, predicts suspension training will continue to catch on. "It's part of this whole functional training movement," says Halevy. "Why athletes like it so much is because it replicates real life activities." While many pro sports teams and fighters use suspension trainers, such as the TRX, regular people are working out with them, he says. The basic idea for the TRX Suspension Trainer was first conceived by U.S. Navy SEAL team member Randy Hetrick, who sought to devise a reliable training system to keep himself and his fellow SEALs in peak condition while deployed for weeks at a time in remote locales. For Hetrick, portability, versatility, and durability were absolutely essential. Hetrick also realized a basic premise of bodyweight training, that the weight of the body itself could be used as a form of resistance to build superior levels of strength. 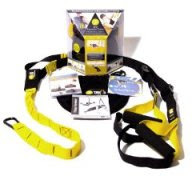 The complete TRX Suspension Trainer system includes a waterproof fold-out mat, training guide, instruction DVD, and a handy storage bag so that you can stay fit at home or on the road. Please click here for more information on this product. Finally, Amazon is currently offering numerous specials on their website to help with all of your New Year's resolutions, from losing weight and getting in shape, to fixing your finances or quitting smoking. Please click here to see all of Amazon’s New Year's Resolution specials and bargains. Birds of the Smokies: The Art of Audubon, Catesby, and Wilson exhibit opens today at the Frank H. McClung Museum as part of the year-long celebration of the 75th anniversary of Great Smoky Mountains National Park. This new exhibit is of 18th and early 19th century hand colored engravings and lithographs of birds native to the Smokies. For this Smoky Mountains Event, the McClung Museum has selected hand colored engravings by Mark Catesby (published 1731-1738) and Alexander Wilson (published 1808-1814), and hand colored lithographs by John James Audubon (published 1840-1844) to illustrate many of the birds native to the Great Smoky Mountains. 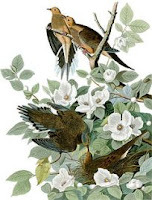 Catesby's prints are the earliest colored depictions of American birds; Alexander Wilson has been called 'the father of American ornithology; and Audubon is famous for his Birds of America. For the Birds of the Smokies: The Art of Audubon, Catesby, and Wilson exhibition, approximately 75 prints will be shown in the Museum's special pull-out exhibit case from now until the end of the year. According to the most recent census from the All Taxa Biodiversity Inventory, at least 246 species of birds have been found in the park. Sixty-one species are year-round residents; and 110 breed in the park, including 52 species from the neo-tropics (a bio-geographic region that includes South America, the West Indies, and tropical North America). Many other species use the park as an important stopover and foraging area during their semiannual migration. The Frank H. McClung Museum is part of the University of Tennessee. It’s located at 1327 Circle Park Drive in Knoxville. Museum hours are from 9:00A to 5:00P Mon - Sat: and from 1:00P to 5:00P on Sundays. Admission is free. For more information, please call 865-974-2144. This edition of Audubon's "Birds of America" displays his hand-coloured engravings in reproductions taken from the original plates of the Audubon Society's archival copy of the rare Double Elephant Folio. The book has been re-organized and annotated by Roger Tory Peterson. Hardcover - only $10.36. Here are all the bird illustrations and the entire text of English naturalist Mark Catesby's book, Birds of Colonial America. Catesby used native plants as a background for his birds; his descriptions, made before the era of systematic nomenclature, are augmented by Feduccia and compared to those of other early naturalists. This glimpse of colonial ornithology will attract historians as well as birders. Click here for more information. Roger Tory Peterson, one of the world's greatest naturalists, received every major award for ornithology, natural science, and conservation, as well as numerous honorary degrees, medals, and citations, including the Presidential Medal of Freedom. The Peterson Identification System has been called the greatest invention since binoculars, and the Peterson Field Guides are credited with helping to set the stage for the environmental movement. A Field Guide to the Birds of Eastern and Central North America was the last book Peterson published before dying in 1996. Only $12.87. Relocation of #26 may be delayed. The Park Trail Map will be updated on the Park website in February and printed maps will be revised and available in July 2009. SUGARLANDS PERMIT OFFICE WILL BEGIN SENDING VISITORS TO THE NEW SITES AS THEY ARE READY FOR USE. The closed campsites will continue to have a sign post and cable systems until the trail maps have been updated and are in use since some visitors familiar with the park will undoubtedly complete permits at self registration and camp in the old sites. This information will be posted on the backcountry permit stations when the new campsites are ready for use. The Frank H. McClung Museum is hosting an exhibition called 'Archaeology and the Native Peoples of Tennessee' as part of the year-long celebration of the 75th anniversary of Great Smoky Mountains National Park. Archaeology and the Native Peoples of Tennessee, a permanent exhibition at the McClung Museum, offers an exceptional in-depth look at the rich Native American heritage in the state and the archaeological work that has assisted in understanding that past. Combining numerous artifacts, graphics, scale models, life-size color murals, videos, and hands-on educational components, the exhibit presents 15,000 years of culture and history, from the Ice Age to the 21st century.